"A musical celebration of both train legends and actual stories has been evocatively assembled by Rounder Records. . . . The young have little, if any, sense of what has been lost with the trading of trains for automobiles and airplanes. But these recordings may evoke some of the romance of the rails for those whose imaginations were expanded by trains calling to them through the night." "The canon of American railroad songs is so rich, so vast that it would be impossible to do little more than just skim the surface of the genre in two compact discs. Leave it to Rounder Records, the respected label of roots and acoustic music, to do the impossible with this pair of anthologies of country and bluegrass recordings. The charm of this set is the way the producers have mixed classic recordings from country stalwarts with material from contemporary artists . . . put these discs in the player, pull out the excellent liner notes by musicologist Norm Cohen, and settle back for a great ride." "This compilation listens like a connoisseur's who's who of country's finest. . . . It's obvious that it was not just slapped together -- a lot of care went into picking the selections and performers. It's very refreshing to hear stuff by these artists that hasn't been played to death. Every cut is a gem. . . ."
"Compiler Michael Hyatt picks a great crop of classic material. . . . Extensive liner notes by historian Norm Cohen supply lots of tidbits about song origins and artists." "How many good songs do you know about airplanes or air travel? We all fly, but since they took away our meals there's no romance left, it's just a way to get there. Rounder Records' collection of train songs reminds you why trains, especially steam locomotives, loom so large in our minds. . . . The 28 tunes are full of rhythms . . . the driving clickety-clack, clickety-clack beat found in many of the songs . . . came from train wheels hitting the joints in rails laid in short lengths . . . and those in which a fiddler or harmonica player imitates the sounds of the steam locomotive, from the hissing steam itself to wheels turning faster and faster and then the train's whistle trailing off into the distance. The notes that accompany the music are themselves worth the price of the CDs." "These two 14-song compilations detail the history of American roots music in the thematic context of trains - a popular topic for songwriters throughout the ages." "These two discs feature a delightful soundtrack to the heritage of one of the world's first industrialized modes of transportation." 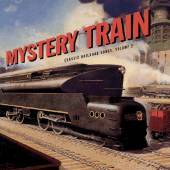 "Classic Railroad Songs...works as a concept as well as a compilation. The most satisfying aspect of this set is that it recalls a bygone era mostly lost on a generation brought up on the internet, cellular phones and home theaters." "A ribbon of steel courses through American music, crossing over genres: folk, blues, bluegrass, jazz, country and rock alike have ridden it. KXCI disc jockey Michael Hyatt has been collecting railroad music for years, and in this two-CD set he offers some of his favorites. Every cut is a standout. 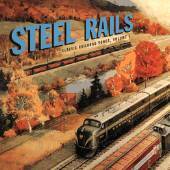 This collection will delight rail buffs and roots-music fans alike."